Is this my last meeting as president? Don Nelson has led the club in song for many years. Get your Don Nelson fix by "clicking" here. Before playing video, please allow about 30 seconds for download. 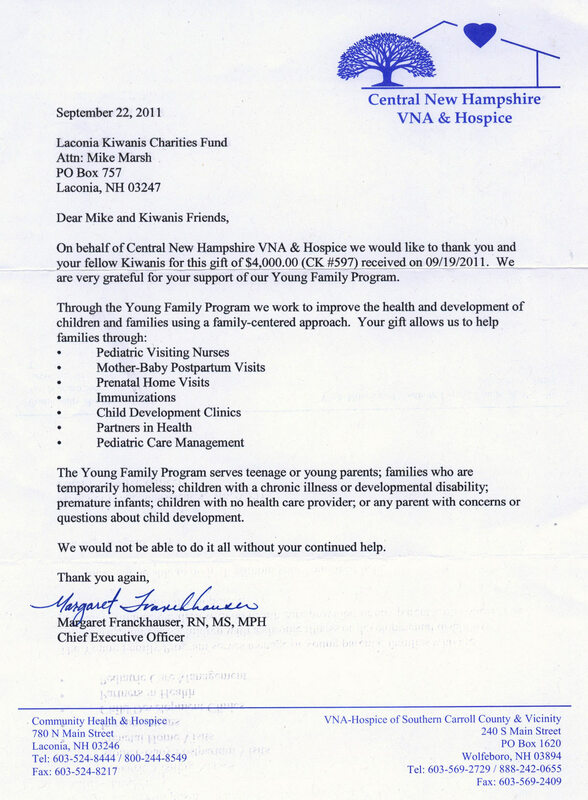 President Mike reported on a “thank you” from Central New Hampshire VNA & Hospice for our recent $4,000 donation. You can read the “thank you” letter by “clicking” here. Voice from member: “heard it was to die for." 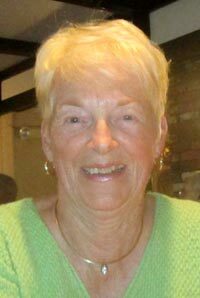 Roger was pleased to report Betty Ballantyne has agreed to be the program coordinator. October 11th will be left open to speak with the newer Kiwanis members to discuss their ideas about the Club. 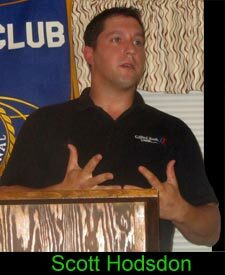 It was also encouraged to bring potential members to the October 24th meeting. 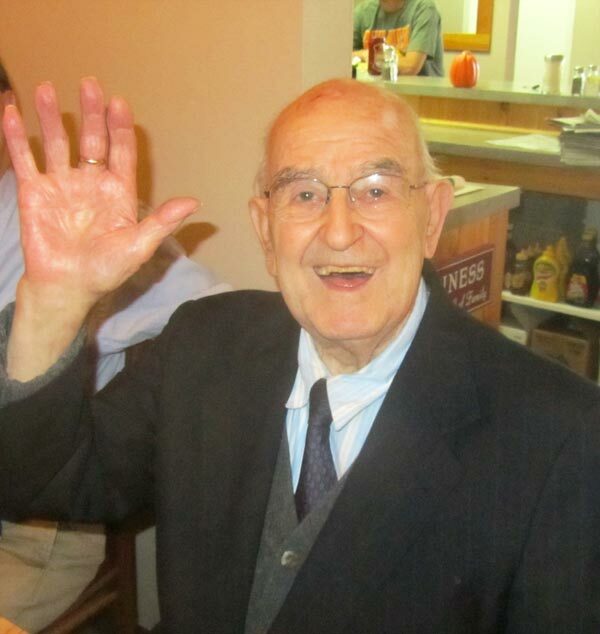 Roger reported he had met with Charlie St. Clair who suggested a potential fundraiser. Charlie reported he has an associate from Massachusetts who has a 1966 GTO for sale that is allegedly worth about $100,000. 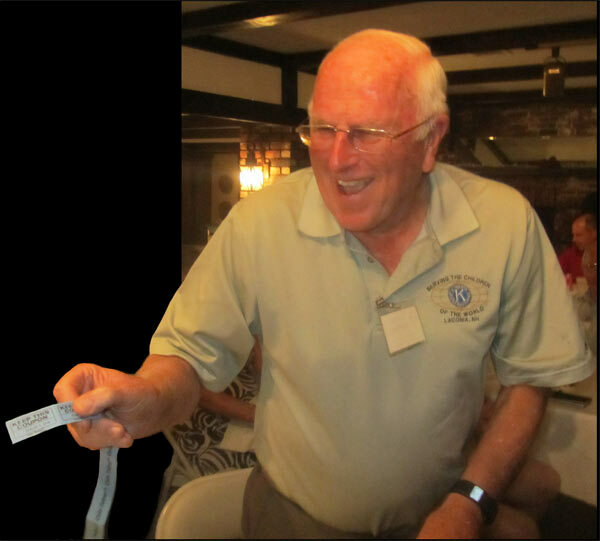 Charlie’s thought was for the Club to have a raffle on the car with the owner receiving a minimum of $40,000. After a discussion with the membership, the Club voted not to pursue the idea. Brian Winslow invited the membership to join the him at the Central New Hampshire VNA & Hospice at their annual dinner meeting at Church Landing on September 27th. Sandra Stafford drew the winning ticket. I win! Thank you, Sandra. • $1 from 1st VP Roger Landry because Mike will be running the next meeting and not him as incoming president. • $1 from Adam Cote because he started his vacation today. • $1 from Brian Winslow because John Walker is still on vacation. Pres. Mike introduced Scott Hodsdon, who is the Director of the Gilford Youth Center, which is located at 19 Potter Hill Road, next to the Gilford Community Church. Scott was responsible for spearheading the new youth center. 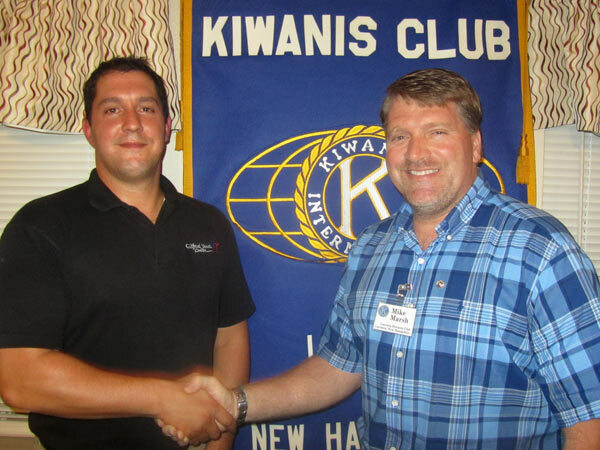 Scott began by thanking the Laconia Kiwanis Club for “their generous donation for their summer camp.” The camp was very successful with over 35 kids attending. 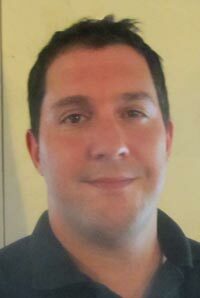 Scott lives in Concord now but has been working in the Lakes Region for about five years. During his presentation, Scott gave a history on the youth center, which opened its doors in 2009. The Center includes a full size gymnasium, a fitness room, a game room, a kitchen, and bathroom facilities. The mission of the Center is to offer safe, fun, affordable, and learning environment for all members of the Lakes Region. For more information on the Gilford Youth Center visit their website by “clicking” here. Tonight's meeting was adjourned at 7:35 pm. On Saturday, August 27th the memory of former Laconia Kiwanian, Roger Ballanyne, was honorored with the 3rd annual Roger’s Ride For A Cure. A heartfelt summary of the event along with sincere thank yous are expressed by Roger's devoted spouce, Betty, in the attached letter which is available by "clicking" here. Family and friends of Roger Ballantyne gather at the Irwin Zone to paticipate in Roger's Ride For a Cure. Happy Jack was spotted at Our Place restaurant (across from Irwin Marine). Peter K extends his best wishes to his fellow members of the Kiwanis Club.